The serious drought currently affecting Venezuela - sparking an energy emergency as hydrolectric dams run dry - has also hit tourists wanting to visit Angel Falls, the highest waterfall in the world. According to a report today in the Spanish news agency Efe, Angel Falls - known as Salto Angel in Spanish or Kerepakupai-Meru to the local Pemon Indians - has lost at least a third of its usual dry season flow, reducing it to a tiny thread of water that evaporates before reaching the base. "There is no water. It´s like having a thread in the centre of your wall at home, like one you would use for sewing clothes. That thread of water is all that's falling", Canaima-based tourist guide Joel Bernal told Efe. Blamed on El Niño, this is the worst drought Venezuela has experienced in 45 years, leading to electricity rationing in the main cities and short blackouts in some rural areas. In Canaima, the jungle base for trips to Angel Falls, the Carrao River is so low that it is not possible to take tourists to the foot of the falls by dugout canoe. 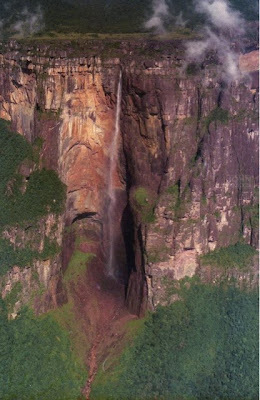 The only option is a fly over in a small plane or an expensive helicopter trip that lands on Auyan-Tepui, the flat-topped mountain from which Angel Falls cascades 979 metres into the Churun River below. The "dry season" period from December to April is always a difficult time to visit the falls as rainfall is very sparse, but according to local guides not a single drop of rain has fallen on Auyan-Tepui since December, bringing river levels to a historic low. Everbody in Canaima is now hoping that Easter brings enough rain to allow the commencement of river trips to the falls. Angel Falls is competing to be one of the 7 Wonders of Nature in a global online competition. I am venezuelan and I havent seen Angel Falls yet. What is happening now made me relized tha we gotta take care of the natural resources we have, for the future generations.. Does anyone know the latest news on the changes for Angel Falls? Today is April 7th 2010? Many years ago a Pemon indian who was a storyteller told me the name was Churum Merú, if Merú means fall what does Churum mean? It is so sad to see that this is happening and there has been little rain fall since you posted this. I hope this changes soon because I hoped to travel there this year since all the other times I have been here in Venezuela I've not had the opportunity to go and see Angel Falls. :( I really hope this changes soon. Things are finally cooling off some here in Caracas but who knows how long it will be before we get any good rains in the rest of the country. Luckily I visited Salto Angel in November and saw it in it's beauty. The words can't tell how marvellous the experience was.